By mid to late 1943 PT operations in the South Pacific, particularly the Solomon Islands, had changed from attacks on large capital ships to interdiction of smaller ships and barges supplying and reinforcing the Japanese forces on the various island of the chain. The Japanese had initially invaded the Solomons and established air and naval bases there as part of the strategy to interrupt allied supply of Australia and New Zealand. The US had invaded Guadalcanal in mid 1942, and had largely established air superiority in the area. The Japanese navy forces, however, were re-supplying the troops on Guadalcanal and other islands with night time missions by sea, known as the “Tokyo Express” that passed through the New Georgia Sound, the site of many battles as the allies disrupted the Japanese supply lines. 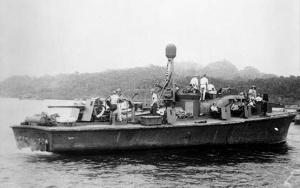 PT crews had discovered that the standard armament of the boats was inadequate for successful attacks on the Japanese barges used in the inter-island transport of troops and supplies. The boats were small and shallow draft and not good torpedo targets, nor worthy of the expense of a torpedo. The front ramp of the barges was armored and the Japanese operators soon learned to keep the bow of the barges pointed to the attackers. The 50 caliber machine guns and the 20 mm cannon proved inadequate to penetrate the armor, especially at safe distance from the small arms fire of the barges, which was a threat to the PT boats and crew, the PT boats being un-armored and lightly constructed of wood. In the field the PT crews experimented with additional, heavier, weapons. In late 1943, these experiments included the conversion of three “late” 77 foot ELCO boats, PT 59, 60, and 61, into “barge busters”. The late 77 foot boats had added deck stiffeners running alongside the cabin and aft deck area to reinforce the deck. The early boats had developed cracking of deck and deck members when operating in heavy seas and the stiffeners were added to counteract the excess flexing of the deck. 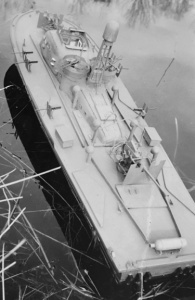 The barge busters had torpedo tubes removed and two 40mm Bofors cannon added, one on the forecastle, and one aft. In addition to the existing twin 50 caliber machine guns, more 50 caliber Browning machine guns were added on three pedestal mounts along each side of the deck. Photographic and written documentation vary as to whether these were single or double machine gun mounts, and some accounts describe a fourth pedestal location just forward of the cabin. Also, there is variation in whether these pedestal mounted guns had shield armor mounted. The armor was heavy and probably not very effective against even small arms fire, so some crews removed it. In the late 1980’s I built a 1:20 scale model of the PT 59, using Al Ross plans from Coastal Forces. This was the boat that was commanded briefly by Lt. John F. Kennedy when he returned to duty after the sinking of the PT 109 and before he was shipped back to the US for medical reasons. While under Kennedy’s command, the PT 59 participated in a daring rescue of Marines trapped by superior Japanese forces. An excellent summary of PT 59 operations under Kennedy can be found at this blogspot. The 1:20 model of the 59 was built primarily as a scale model, but was equipped for RC operations as well. I used a 540 motor running through a home made gearbox to power three propellers using 1/8″ shafts and scale size propellers and rudders. The boat was detailed using scratch built cabin and fixtures, and included a detailed interior for the cabin. The guns were cast metal commercial versions of the 40mm Bofors and the Brownings, with added armor shields. I mounted single machine guns on the six pedestals, as that was consistent with the Al Ross plan and contemporary descriptions and photos. Photo of the 59. Reposted from blog referenced above. The model looked pretty good, and eventually found a home in the PT Boat Museum at Fall River, MA. Its performance, however was disappointing. The scale propellers did not have the pitch or surface area to move the boat at anything like full speed. And, when full throttle was applied, the propellers produced cavitation, causing loss of propulsion and completely neutralizing the rudders. A failed experiment.